SINGAPORE, Feb. 12, 2014 – Boeing [NYSE: BA] and Nok Airlines Public Company Limited announced today from the Singapore Airshow a commitment to order eight Next-Generation 737-800s and seven 737 MAX 8s. Boeing will work with the Bangkok-based airline to finalize the details of the agreement, at which time the order will be posted to the Boeing Orders & Deliveries website. SINGAPORE, Feb. 12, 2014 /PRNewswire/ -- Boeing [NYSE: BA] and Nok Airlines Public Company Limited (Nok Air) announced today from the Singapore Airshow a commitment to order eight Next-Generation 737-800s and seven 737 MAX 8s. The commitment, valued at $1.45 billion at list prices, will establish Nok Air as the first airline in Thailand to operate the 737 MAX. Boeing will work with the Bangkok-based airline to finalize the details of the agreement, at which time the order will be posted to the Boeing Orders & Deliveries website. While Nok Air currently operates a fleet of 14 Next-Generation 737s, this will mark the airline's first direct order with Boeing. 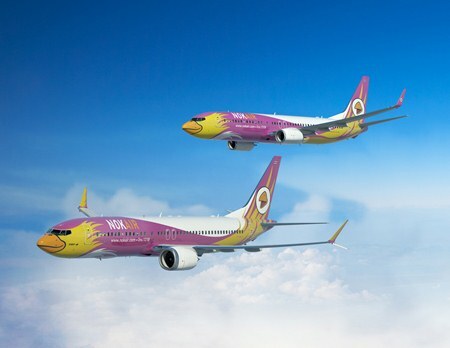 "This commitment is a major step in our growth strategy," said Patee Sarasin, CEO of Nok Air. "The 737 is the backbone of our fleet and will continue to be in the future. These airplanes position us for growth and ensure that we'll continue to operate the most reliable and fuel-efficient aircraft." "The 737 has been a key component of Nok Air's growth over the past 10 years," said Dinesh Keskar, senior vice president of Asia Pacific and India Sales, Boeing Commercial Airplanes. "The 737 MAX is an excellent complement to Nok Air's fleet and its low-cost business model. The airplane's efficiency, reliability and passenger amenities will enable the airline to continue to provide its customers high-quality service at a low cost." The 737-800 is one of the best-selling versions of the highly successful Next-Generation 737 family, the most technologically advanced airplanes in the single-aisle market. The Next-Generation 737's market success has been confirmed by investors who consistently rank it as the most preferred single-aisle airplane due to its wide market base, superior performance efficiency and lowest operating costs in its class. The 737 MAX brings the most advanced engine technologies to the world's best-selling airplane, building on the strengths of today's Next-Generation 737. The 737 MAX incorporates the latest-technology CFM International LEAP-1B engines to deliver the highest efficiency, reliability and passenger comfort in the single-aisle market. Airlines operating the 737 MAX will see an 8 percent operating cost per seat advantage over tomorrow's competition.